and women, is celebrating its 40th birthday this year, starting this LGBTQ Pride month. 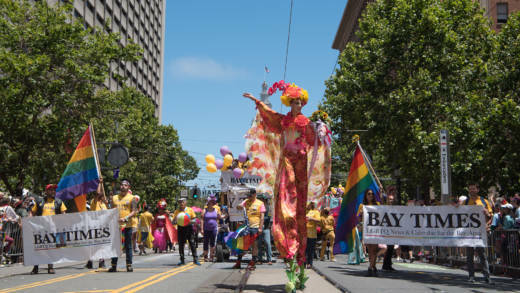 Though the first issue came out in May of 1978, the newspaper's publishers plan to celebrate its anniversary through the entire year, starting with having a big presence during this year's pride parade. They've even adopted a slogan for the birthday: "A million stories in 40 years." "It's kind of metaphorical because I don't know if we've really published a million stories," Bay Times publisher Betty Sullivan said. "It doesn't really matter; it's symbolic." Roland G. Schembari, a journalist who worked on KPFA’s Fruit Punch, the nation’s first gay-themed radio show, started the paper with friend and respected journalist Randy Alfred. The two had big dreams for the newspaper, which was one of the first to focus exclusively on issues in the gay community. "These guys decided they wanted lesbians involved, which is very forward-thinking because it recognizes that we need to put effort into that," Sullivan said. "Otherwise, we just fall into segments." Schembari and his friend Bill Hartman tried again the following year, starting a new four-page publication called Coming Up!, which acted more as a gay-themed event calendar but still included some news coverage. It couldn’t have come at a better time, as 1979 was a huge year for gay issues, being the year of the National March on Washington for Lesbian and Gay Rights, which was then the largest ever political gathering in support of LGBTQ rights. It was also the year after Harvey Milk’s assassination and the White Night Riots. In 1981, photographer Kim Corsaro became editor and publisher, and helped grow the paper to a circulation in the tens of thousands. That period was important, with the AIDS crisis wiping out much of the community and inspiring queer activism. 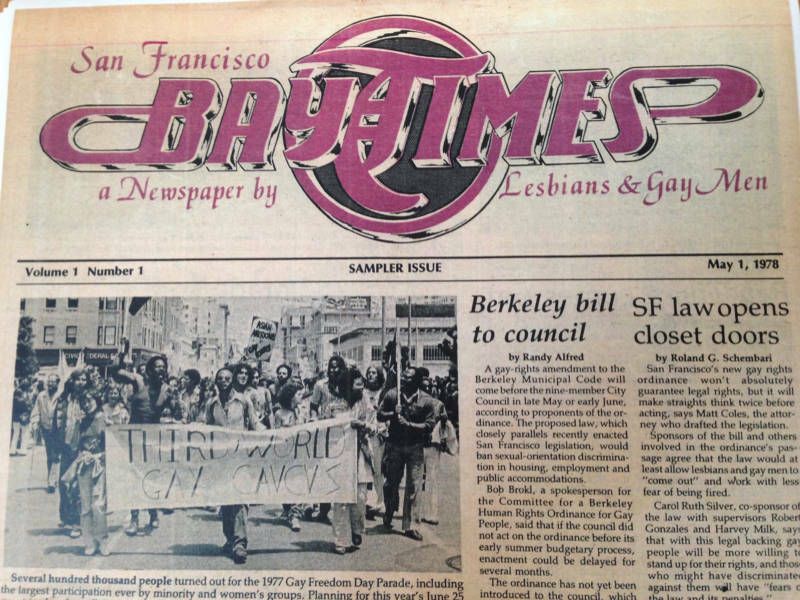 Seven years after Corsaro became publisher, the newspaper changed its name back to the San Francisco Bay Times. The paper was at the center of controversy in 1992, after it ran a provactive graphic of then-San Francisco police chief Richard Hongisto, criticizing his handling of local protests over the Rodney King verdict. Hongisto reportedly ordered three officers take and destroy about 2,000 issues of the paper with the offending graphic. After some of the officers revealed Hongisto's commands, he was fired. He had been on the job for only 44 days. Around a decade ago, the paper saw a change in leadership. Schembari died in 2000 of cancer, and Corsaro stepped down as publisher in 2011 because of some health and family issues, according to Sullivan. "[Corsaro] held onto that position for 30 years. Being the publisher of a small gay-and-lesbian newspaper for three solid decades is pretty amazing," Sullivan said. 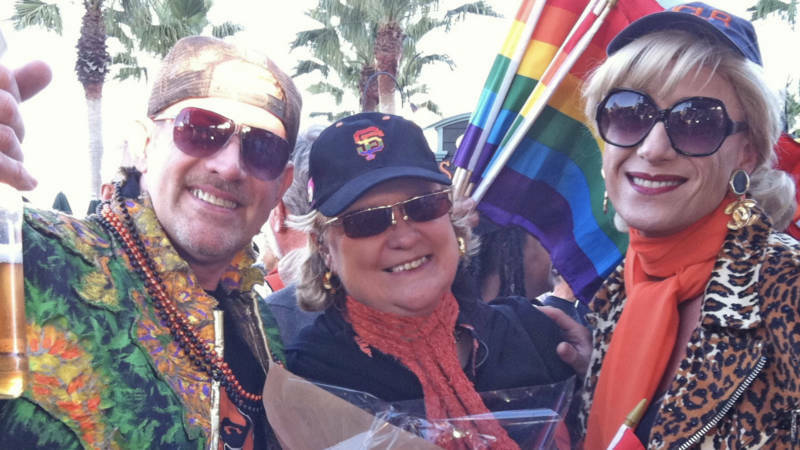 Sullivan, a longtime journalist and founder of the influential LGBTQ listserve Betty's List, and Discovery Channel senior news correspondent Jennifer L. Viegas both took over the publisher roles at the Bay Times. They focused expanding on their web presence and ensuring they stay an important voice in the community. "I think we also want to make sure that we uphold our educational goal that we are providing information that people need to be in control of their own lives," Sullivan said. Sullivan and Viegas also work to ensure that the Times is a leading voice in the community. For example, in 2014, after then-San Francisco 49er Chris Culliver made offensive comments about the gay community at that year’s Super Bowl, he gave an exclusive interview to the Bay Times discussing how he had spent the following months learning about the LGTBQ community. Last year, the paper set up the Castro Street Cam, a webcam providing 24/7 live streaming views of the historic Castro Street in San Francisco. The cam provides a real look at the epicenter of culture, so people all over the world can see what it’s really like there. n Castro Street," Sullivan said. "I think it shows the happiness and joy of this community." 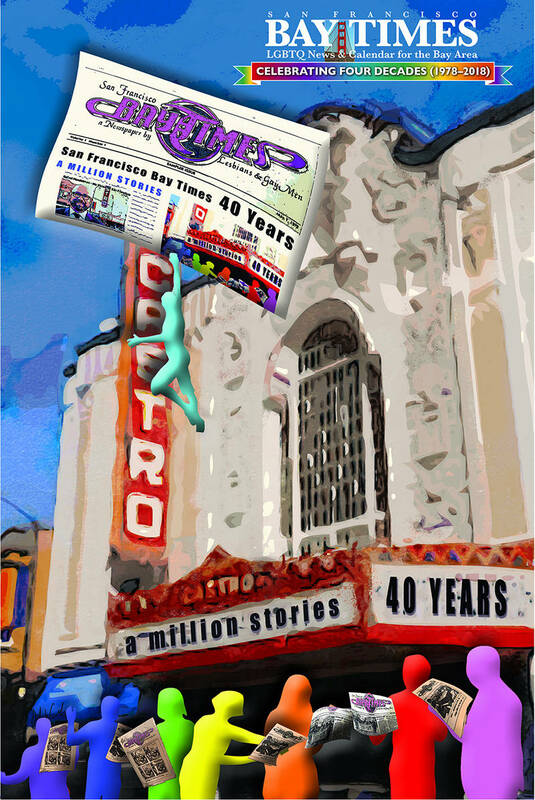 Sullivan and staff are working on a few events to celebrate the paper's 40th year of publication, such as a dance party cruise around the San Francisco Bay and a panel talk that will include original news editor Alfred. Dates and venues are still being determined. As for the future of the paper, Sullivan says they plan to keep doing what they're doing. They hope to keep publishing a physical newspaper, but continue to expand their growing online audience and social media presence. The one thing Sullivan says will never change is the paper's mission to having gay men and women working side-by-side. "We are bound and determine to carry the flag or torch for that stated purpose of bringing men and women together," Sullivan said.